In 1953 Violet Sullivan disappeared. Now, thirty-five years later in Kinsey-time, Violet's daughter Daisy hires Kinsey Milhone to find out what happened to her. Violet's busy past ensures that there is no shortage of suspects. The Kinsey Milhone (alphabet) series is well through the alpabet, but little time has passed. 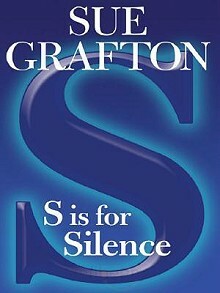 Sue Grafton is determined to keep Kinsey free of mobile phones and the internet. We follow Kinsey's first-person narration as she reports the progress of her investigations, interspersed with the details of her simple lifestyle. Grafton gives us a heroine who is smart and flawed, organised and willing to take chances, insular, but loyal to her few friends. All in all the Kinsey books in general, and this book in particular are a comfortable read in which we have action, characterisation and the feeling of joining in on an adventure with an old friend. See also:Kinsey Milhone series reading order and synopses Search Festivale for more work by this author.